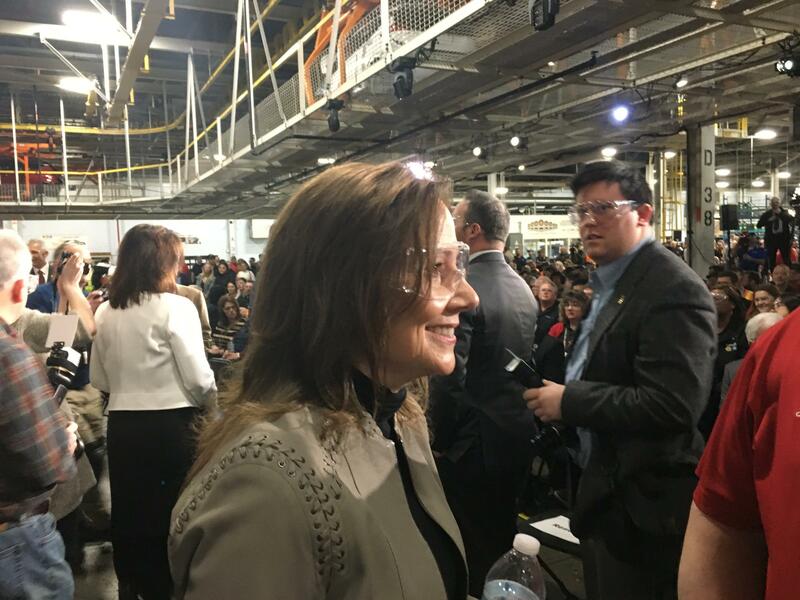 GM CEO Mary Barra greets officials at the announcement of investment in the Orion Assembly Plant. General Motors CEO Mary Barra says the automaker will build a new electric vehicle at its Orion Assembly Plant - where it already builds the all-electric Bolt. She says details about the vehicle will come later. Barra, who's been head of General Motors since 2014, says GM will invest $300 million in the plant and add 400 jobs. "EVs are going to help us drive our vision of a world with zero crashes, zero emissions, and zero congestion," says Barra. "And allow us to deliver cleaner air and a healthier planet." Barra says GM had originally planned to build the vehicle elsewhere, but decided to build it in the U.S. in part to support provisions in the Trump administration's proposed free trade agreement with Mexico and Canada. She says the auto industry is in the "very early stages" of electric vehicle development, but says GM will invest in much more marketing of EVs in the future to convince customers to switch. General Motors says it’s extending the life of its Detroit-Hamtramck Assembly Plant for another seven months. The company had planned to close the plant in June, but GM said Friday it will now keep it open through January 2020. It's been a couple days of good and bad news for General Motors employees. GM announced Tuesday it's adding a thousand workers to build heavy duty trucks at its Flint Assembly plant. That's just as the automaker begins laying off 4,000 white collar workers, over the next two weeks.